This sequence of poems emerges from the poet’s attempts to find out more about the elusive and enigmatic figure of his grandfather, to ‘fix his likeness’ as it were. 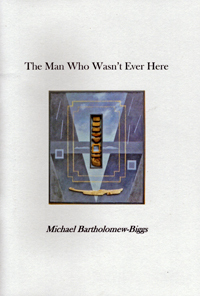 Using documented fragments of a private story and his own considerable powers of imagination, Michael Bartholomew-Biggs creates an engaging tribute to an ordinary life that takes him closer to his own roots. It is a narrative that might have passed relatively unnoticed yet which nonetheless is integral to the wider sweep of history as it touches on currently sensitive issues of immigration, national identity and terrorism. and bar talk cruises off again. who might have been from hereabouts. has met with courteous consideration. on a gust of curiosity. her own hair right up to the end. to let some smoke escape. But not the clients. on Cromwell, Irish beef and Eddie Jordan. of the man who wasn’t ever here.